The lowest possible house edge for a bet in Craps is 1.4%. Craps is similar to high limit Baccarat in the way that the placement of your bets will result in a differing house edge. A bet on one area might give a house edge of 1.4%, whereas another gives a house edge of up to 16.7%. Compared with the main high limit Casino games on this site, Craps comes in at third in terms of having the lowest house edge... behind Blackjack and Baccarat. 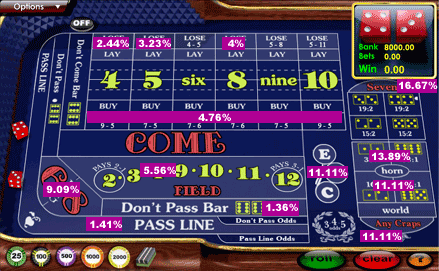 Reducing the house edge in Craps is all about knowing the odds and payouts of the different possible bets at the Craps table. The diagram and table below give an overview of the house edge for each of the various bets. That diagram should be helpful. It was difficult making the Craps bets house edge stand out for each bet, so I put a purple background behind the text to help. As you can see, there are very few bets that actually provide a low house edge. So whilst Craps is great for entertainment value, the odds aren't as great as they are for Blackjack or Baccarat. The table above along with the diagram give the house edge for the majority of bets at the Craps table. However, there are a few minor ones that can be found on the trusty Wikipedia Craps information page. There is no strategy for Craps like there is in Blackjack that will increase your chances of winning money. The only thing that you can do is bet wisely, and go for the bets with the lowest house edge. If you stick to the Pass Line and Don't Pass bets, you will stand a better chance of winning money than if you bet on Any 7 all the time. Just use the table and diagram above to help you get a feel for the house edge across the Craps table. This is the only "strategy" that you can use. The lowest house edge for Craps can be a little deceiving, as the majority of the bets that can be placed give the house a much bigger advantage. I would put Craps in the same boat as high limit Roulette, as they are focused on entertainment through varieties of bets and odds with lots of action. Blackjack and Baccarat on the other hand have a lower house edge, but there is far less variety in the games. If you're looking for a Craps recommendation, the top Casino for high limit Craps is easily Pinnacle. The high $2,000 per bet limit and no table cap makes it the perfect choice for high rollers.